No power electronics, no electric drive. ZF has developed a process for further improving these components. Its approach involves measuring temperature without a thermometer. Andreas Neemann wrote his first ZF text in 2001 about 6HP transmissions. Since then, the automotive writer has filled many publications for internal and external readers, showcasing his passion for the Group's more complex subjects. Engineers hate it when they are left in the dark, especially if they design components that have to last a long time and be reliable. If they don't know the actual load restrictions on a part or component, engineers usually build in high safety reserves. But then they run the risk of oversizing. Imagine that an architect who cannot precisely calculate the impact of a hailstone designs a concrete dome as the roof of a house. Naturally it would not only withstand the hailstones, but even light artillery fire, however it would also be much too expensive and too heavy. Core question: How fast do semiconductor modules wear out? Until just recently, the developers of power electronics for electric drives had been missing an important piece of information: How strong are the temperature fluctuations that the installed silicon chips are subject to under real driving conditions? Ultimately, such semiconductor modules are not only expensive, but also sensitive. Constant heating-up and cooling-down make the material prone to crumble. If the semiconductor breaks, the entire power electronics system interrupts its service. This is fatal because without these control boxes, electric and hybrid vehicles simply stop running. Power electronics control the flow of electricity from the battery. Also, they convert their direct-current voltage into a three-phase alternating voltage to drive the electric motor. To prevent the power electronics from failing, engineers have played it safe to date by using more semiconductor modules than are necessarily required. The larger the semiconductor surface, the better the temperature balance. However, this solution is similar to the image of the concrete dome as a house roof. “Oversized power electronics are not optimal when it comes to installation space and costs,” says Marco Denk, head of Advanced Engineering Power Electronics in the ZF E-Mobility Division. Since engineers always like to find the optimum solution, Denk asked himself the following question: How can temperature fluctuations and their impact on the service life of a semiconductor be more precisely determined? If we knew the answer, then only as many of those expensive modules as truly needed would have to be installed for the service life of a vehicle, including safety reserves. In vehicles with an electric motor and in hybrid vehicles, the power electronics are responsible for effectiveness, thus determining the range and the efficiency of the electric drive. The chart shows the configuration of a vehicle with front-transverse installed combustion engine and electric drive in the rear axle. His dissertation topic at the University of Bayreuth was a process to measure and record the temperature of semiconductors in power electronics. “It sounds easier than it is. The topic stipulated that no additional measuring or transmission devices could be used because this would generate costs and take up valuable installation space,” recalls the engineer. In addition to temperature measurement without a thermometer, there was also the task of recording the data without additional storage or radio chips. Denk discovered a gate resistance in the existing electronics whose signal flow could be slightly repurposed. Because this resistance was close to a barrier layer exposed to a heavy thermal load, the temperature could be determined from voltage differences. In the end, Denk “only” had to ensure that the data were compressed and recorded such that they could be read out after operating the vehicle. In this, he also succeeded. The temperature values from several drives were saved onto an 8-kilobyte memory component that was already installed in the electronics anyway. Denk’s process is so simple and yet so brilliant that he has already won several renowned awards, including the CTI Young Drive Experts Award. This approach also enabled Denk to create fundamental principles just the way automobile engineers like them: They are now officially swimming in data based on which the actual temperature fluctuations occurring in the “heart” of the electric vehicle can be determined – and using the most diverse passenger car models and load profiles imaginable. 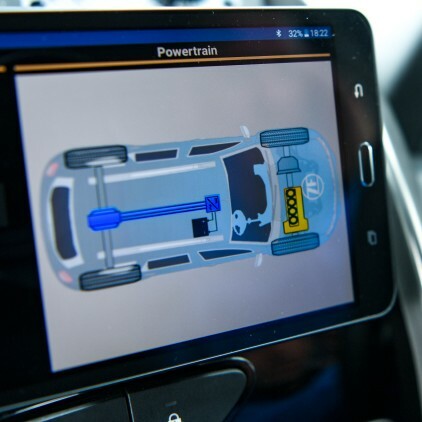 ZF is using the process, which it has meanwhile patented, and the data acquired from it to configure power electronics optimally, so that they are lean, reliable, cost efficient and compact. 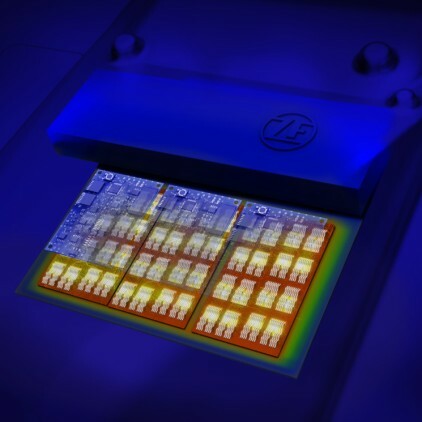 High temperature fluctuations reduce the service life of semiconductor modules. These are extremely important components in power electronics for electric drives and hybrid vehicles. Since, up until now, the temperatures in real operation cannot be measured, the expensive chips used were often oversized.